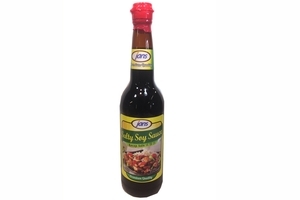 Jans Salty Soy Sauce ( Kecap Asin ) in 21fl oz (620 ml) bottle . Try our great tasting soy sauce. Using only hand selected freshly picked soy bean, our innovative manufacturing process assures consistency and quality, A perfect condiment by itself, try our sauce to greatly enhance the flavor on any bbq or as marinade to bring our great taste. Product of Indonesia. Halal Certified حلال . Soybean Extract, Water , Salt, Spices.